Nutritional cleansing is the most effective process for streamlining your body’s systems and naturally boosting your energy and fitness. By replacing toxins and impurities with essential nutrients, you benefit from an increased metabolism and healthy digestive system. Planning your cleanse day involves scheduling it in advance, preparing your fridge, and planning a full day of activities. A cleanse can be physically demanding but even more mentally demanding. Isagenix offers a planner for cleanse days that can help you structure your day for success. Know in advance what your snacks and meal will be and purge your fridge of unhealthy food that may prove too tempting during your cleanse. Additionally, it is helpful to keep yourself busy with activities to distract yourself from temptations: plan an outing with friends, make a list of chores, and spend time outside to pass the time. Water is an essential element of your cleanse day, both for hydration and to help flush out toxins. Drink at least 3 litres of water on your cleanse day. (More still if you plan to exercise or get dehydrated easily.) Becoming dehydrated can have disastrous effects for your cleanse day and can result in lasting illness – the opposite of what a cleanse is designed for! Drink extra water especially if you feel fatigued, light-headed, or have aches and pains. 3. Listen to your body – don’t overdo it! Isagenix customers are often highly committed to their fitness goals: an admirable trait that can sometimes go too far. For a safe cleanse, it’s important to check in with your body and make sure that you aren’t overdoing it. It is natural to feel a little hungry or fatigued during your cleanse day, but pay attention if your body starts to send strong signals. Don’t let a strong will and stubborn mind keep you from staying healthy! As always, if you are experiencing severe illness, pain, or discomfort, seek medical attention. 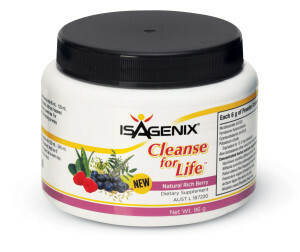 Your Isagenix cleanse should always be a positive, beneficial experience – only by overdoing it will you put yourself at risk. For more tips on how to complete a cleanse day see this article.